My first thought was that the setting would be the star of the evening. Then I saw Venus, shining brightly above and providing a magical layer to the lighting. 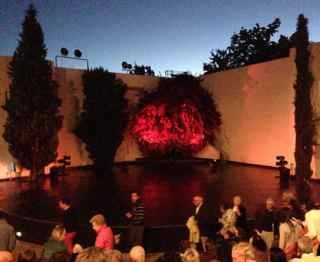 There was a lot for the Cape Dance Company dancers to compete with at Oude Libertas Amphitheatre on a beautiful Stellenbosch evening. But we were quickly propelled to the magical, transformative ‘Planet Ballet’ by When Dawn Comes, Christopher L Huggins’s powerfully mesmerising pas de huit. This stunning, emotive piece about relationships took me on a journey through all the seasons of love. I was especially struck by the harmony of the eight dancers, who were clearly vibrating as one. I felt I could hardly tell the male from the female, the alpha from the beta. Classic Cape Dance Company deliciousness. We were soon shocked out of our reverie and taken on different journeys by Bradley Shelver and Joshua Beamish and back again to a very different Huggins. The evening of five ballets directed by Debbie Turner felt like an ambitiously curated art exhibition combining Renaissance Masters with Pop Artists, a few Modernists and a Surrealist. Back on earth after the show I was sad that there is only one more performance, at 8h15 on November 23. Tickets from Computicket or the Oude Libertas box office on 021 809 7473/7380. And, while you are at, get yourself a ticket to Cadence, featuring new ballets by Christopher L. Huggins and Joshua Beamish. The Cape Dance Company’s production is on at Artscape from November 28 to December 7 2013.